Being a successful lawn and landscape owner requires many traits – patience, dedication, great management skills, passion and the ability to make smart decisions. At Weed Man USA, we interact with industry people on a daily basis, and we’ve found that some of the biggest struggles they experience in owning a business have to do with employee management and retention, as well as having a poor bottom line. Every business-related struggle has a solution, whether it be taking on a different leadership style, offering competitive incentives or diversifying your services. Solution: Every business owner is different in their employee management approach. If, as a business owner, you find that you are having difficulty effectively managing your employees, there are a number of strategies you can try to improve your efforts. To achieve maximum effectiveness and efficiency when delegating tasks, ensure your employees understand exactly what you want them to do. Spend a few extra minutes to successfully communicate what the task is and let them know you expect feedback throughout the process, as this will allow you to monitor their progress and assess whether or not the final product is up to your standards. As an added benefit, this approach requires less micromanaging Determine in advance how you’ll reward employees for a job well done. Successful delegation of authority takes time and energy, but it does pay off in the end. Empowering and trusting your employees and appreciating their success will build their self-confidence and provide you with a higher caliber product. Solution: Owning a business in a seasonal industry can be difficult. With the possibility of a 4-month layoff period in the winter, it’s hard to sometimes keep employees. Although offering a competitive wage plays a significant role in retention, there are definitely other things to consider when it comes to keeping your employees for the long term. Instead of layoffs, look at downtime as an opportunity for staff to explore other skills relevant to your company. It’s always smart to cross-train employees in case you require some extra help. This also gives you more confidence in promoting from within, when and if that time comes. Or why not consider diversifying your business and offering winterized services during the colder months? Additionally, if you do find quality people, offer them incentives to stay, such as increased responsibility, a new and better title, or improved compensation. Good workers are the backbone of any successful company, after all. Make them feel a part of the team and not just like it’s a temporary position. Solution: There are many ways to better your bottom line. It’s often hard to balance your time focusing on business developmentwhile remaining visible and active in the field. Improve cash flow, gain more market share and balance your time more effectively by making smart investment decisions. Weed Man has helped hundreds of landscape professionals better their businesses. Today’s markets are filled with opportunity, but owners need to move fast. Several Weed Man franchisees owned existing businesses and saw the value in aligning themselves with a national brand. They were looking to diversify their services and Weed Man was their answer. 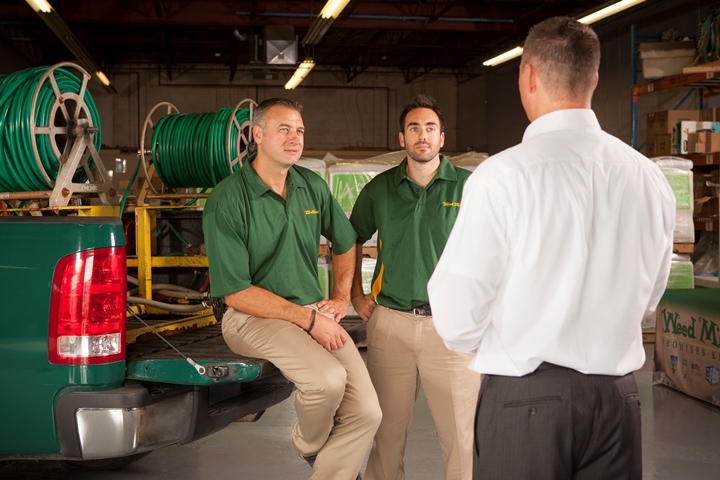 We are the fastest growing lawn care franchise out there, and we don’t plan on slowing down any time soon. We were recently named One of the Best Franchises to Buy by Forbes magazine! We currently have several franchise opportunities available throughout the U.S. If owning a lawn care business is something you’ve considered, or if you already own a business and are looking for an additional profit center, Weed Man is a great option, and we would be happy to meet with you to determine whether it would be a good fit for us both. For more information on franchising with Weed Man USA, visit http://www.weedmanfranchise.com. Very nice post. I just stumbled upon your weblog and wanted to mention that I’ve truly enjoyed surfing around your weblog posts. In any case I will be subscribing in your feed and I am hoping you write again soon!